Here is Foxhunter and Lt-Col Llewellyn. I wonder if any examples of this still exist? 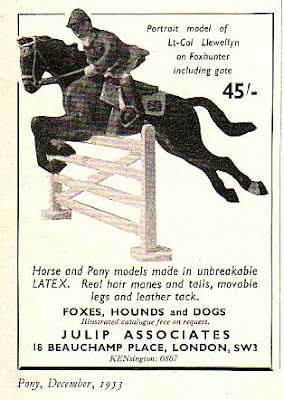 This model, and the Arab below, both appear to have latex rather than mohair tails. 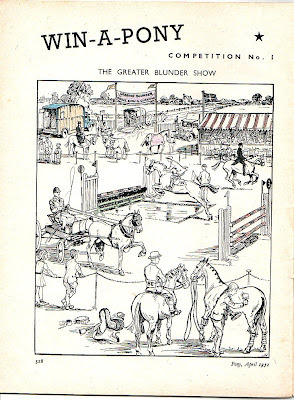 Pony Magazine ran a win a pony competition in its early years. The competition stretched over some months, with new elements to complete each month. Here is one of them - I thought it might be fun to see what we could spot now (and was also wondering if there were many things we would miss simply because things have changed: it's probably much less likely I'd have thought that we would know as a matter of course what happened with driving setups). I haven't yet dug up the answers, I have to admit. To make a Horse follow his Master, and find him out and Challenge him amongst never so many people. Take a pound of Oat-Meal, and put to it a quarter of a pound of Honey and half a pound of bunacre, and make a Cake thereof, and put it into your Bosom next to your naked Skin, then run or labour yourself till you Sweat, then rub all your Sweat upon your Cake, then keep him fasting a day and a night, and give it him to eat, and when he hath eaten it, turn him loose, and he shall not only follow you, but also hunt and seek you out when he hath lost you or doth miss you, and though you be environed with never so many, yet he will find you out and know you, and when he cometh to you spit into his Mouth, and anoint his Tongue with your Spittle, and thus doing he will never forsake you. By "An Experienced Farrier," found in The Horseman's Week-End Book. Anyone tried it? Though of course, you do need to know what Bunacre is, and I haven't had any luck finding out so far. All of my roses are single and not repeat flowerers, so it is an amazing treat to find a few flowering in the garden now. It's been an odd year for some plants, and things like jasmine have only come into flower now, it having been too dry for them earlier in the year. Boule de Niege (though I have a sneaky feeling this might be a repeat flowerer). Looked it up. Yes , it is. Didn't do it last year though - I wonder why? Many thanks to Susanna for sending me this link. 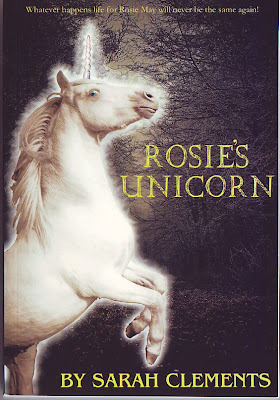 It's possibly not a first edition: that was bound in red, blue or green, with the horse's head looking to the right. John Carter (More Binding Variants, Constable, 1938) thinks this is a variant of the first: whether it is or not, it's still a very early edition. A first edition will cost upwards (sometimes very well upwards of £3,000). If pony books are your thing, and you travel by public transport, you will occasionally (or perhaps often) meet the situation when you are deep in your latest re-read of Ruby Ferguson'sJill, and you want to take something with you to read on the train. Do you take Jill? Well, there's a sort of muted yes from me there. If I'm reading Jill, or a Pullein-Thompson, I'll take it. If, however, I'm reading one of the pinker, fluffier modern things (for research purposes, natch) I admit I feel a twinge. Do I want the world to know I read Katie Price's Perfect Ponies and its ilk? Which, now I think about it, is faintly ridiculous, because I've reviewed them on theworldwide web, for goodness sake. It's perfectly obvious I do read them. Thanks to Sarah Clements for sending me a copy of this book. Sarah Clements runs the Cam Valley pony rescue centre near Paulton, which specialises in rescuing and rehabilitating British native ponies. You can read plenty more about the centre's work on their website, which includes lots of detail on the ponies and their histories. If you'd like to support the rescue, there is a facility to donate via the website. 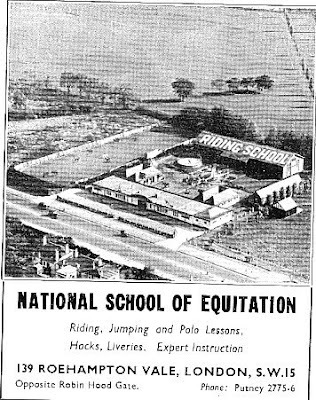 The National School of Equitation in Roehampton (it was at 139 Roehampton Vale, London SW15, but now seems to have been replaced by either Kingston University or a golf course) was a regular advertiser in the early issues of Riding Magazine. It was obviously hard to miss, even from the air. How much Exmoor pony is there in the Thoroughbred? It was the classic riding school quiz question: who were the founding stallions of the Thoroughbred? And we all know, don't we - the Byerley Turk, the Godolphin Arabian and the Darley Arabian. What we don't know is who the founding mares were. There were some 72 of them, and many were not named in pedigrees, some being simply known as "A Royal Mare". A study by the University of Cambridge, led by Dr Mim Bower, has set out to identify where the founding mares came from. Some breeders claim the Thoroughbred is descended from pure Arabian stock, but the Cambridge research shows that wasn't the case: it was British and Irish mares who were most influential on the maternal side. 61% of the founding mares were from British or Irish breeds, and only 8% had Middle Eastern or West Asian links. The Cambridge study came to the conclusion that there was already a vibrant racing industry into which the Eastern stallions were introduced. Warwickshire's County Record Office feature a Record of the Month on their website: August's was Sir Richard Newdigate's Horse Book. Sir Richard Newdigate (1602-1678) lived near Nuneaton, and was Lord Chief Justice during the Commonwealth. He was something of a micro-manager, leading to a very fast turnover amongst his household staff: his stables were closely supervised too. Did this, I wonder, lead to a fast turnover amongst the stable staff? No, really. If you don't fancy just any old rocking horse, you can now get one in the form of Lucinda Frederick's Headley Britannia. That'll show them in the nursery. Oh, I'm torn over this picture. Last week's Horse and Hound had a news story about Emile Faurie, the dressage rider, who has decided (wisely in my opinion) that if you do not wear a hat, you cannot ride. Dressage riders have a tendency to go without hats, presumably thinking that as they're not going to jump or go particularly fast, they're safe. As someone who has fallen off at a standstill (don't ask) I know that's not true. And yet.... this photograph below - all hatless dressage riders need transporting back to 1937, which is when this photograph was taken. 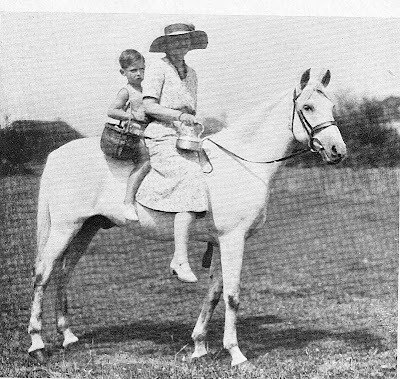 It's of Lady Kitty Ritson, dog breeder, and later on a pony book author, who wrote a series of articles on The Middle Aged Rider for Riding Magazine.